I picked up the first CD I found at the library that had that track on it. 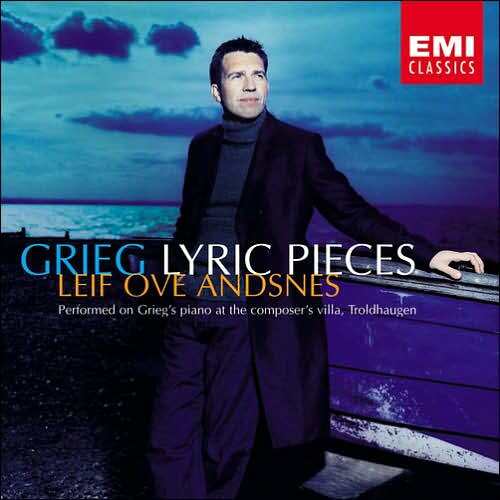 It was Grieg: Lyric Pieces (Performed On Grieg’s Piano),performed by Leif Ove Andsnes. This isn’t the dark romance of Beethoven’s “Moonlight Sonata;” Grieg gives us a sprightly march that wraps us up in the ongoing fun of a relationship that’s as comfortable as it is exciting. As with the heroic marches that we might expect to hear over the end credits of an action movie, there’s even a lilting slow section in the middle before the familiar melody bubbles back up to carry us to the tune’s satisfying conclusion. Of ocurse, this is only one of 24 pieces on this album and, so far, the rest seem just as effectively accomplished.